DAY 4 Monday VILNIUS – ZIEZMARIAI – KAUNAS. Morning departure to Kaunas. En route stop at unique wooden synagogue of Ziezmariai. Afterwards continue to the Ninth Fort Museum, a former death site of thousands of Jewish nationals during the World War II. Arrival to Kaunas - second largest city of the country and the capital of Lithuania between the World Wars. During the sightseeing tour of Kaunas Old Town, you will pass by castle ruins, the Town Hall Square, Cathedral and Perkunas House. 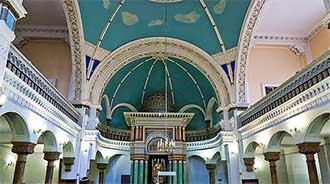 Visit former Kaunas Jewish ghetto, Kaunas Choral Synagogue, striking for its black and golden colors, as well as its Children's Memorial. Learn aboutLeah’s Goldberg life in Kaunas and great things Japanese diplomat Chiune Sugihara has done to save around 6000 jewish people when Holokaust started. Overnight in 4* Europa Royale hotel or similar. DAY 6 Wednesday RIGA. 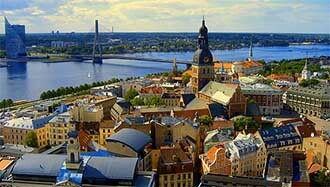 Day to get acquainted with charming Old town of Riga, while strolling through the cobble-stone, picturesque streets. 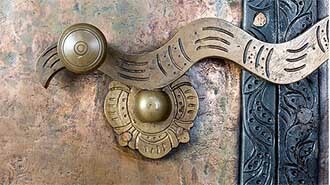 Visit the chic "Art Nouveau" district, where many prominent Jewish Latvians, among them the philosopher Sir Isaiah Berlin, once lived. Riga has one of the world's most impressive collections of authentic Art Nouveau architecture, and uniquely offers streets whose buildings are preserved almost entirely in this early 20th Century style. In the museum “Jews in Latvia” you will learn about life of Jews in this part of the world. Pass by the site of Jewish Ghetto and visit the only remaining Synagogue, which today serves as the central meeting place for the Jews of Latvia. Standing since the beginning of the 20th century, the synagogue was most likely spared from burning due to its fortunate location in the Old Town, where fires could be devastating to the surrounding buildings. Overnight in 4* Europa Royale hotel or similar. 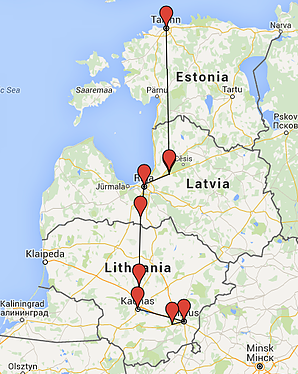 DAY 7 Thursday RIGA – TURAIDA- PARNU – TALLINN. Drive alongside the Riga Bay to Estonia’s capital city - Tallinn. Pass by part of Gauja National park and stop at Medieval Turaida castle. Another short stop at Estonia’s resort town – Parnu. Late afternoon arrival to Tallinn. Accommodation in 4* Vana Wiru hotel or similar. DAY 8 Friday TALLINN. This morning, enjoy a tour of the charming city of Tallinn, rated as one of Europe's best-kept secrets by several travel and placed on UNESCO's list of World Heritage sites. Drive to the Old Town on top of the hill, to find breathtaking views of the tiled roofs and colorful houses below. Stroll the beautifully preserved Medieval streets and become a part of Tallinn's thousands year-old history. 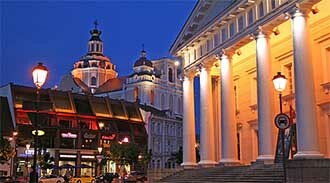 Walk past the impressive Alexander Nevski Cathedral to theTown Hall Square. Continue to the intimate Tallinn Jewish Center for coffee, tea, and cake and learn about Jewish community life in Estonia. Synagogue visit. Free afternoon to enjoy cafes, bars and get beautiful souvenirs. Overnight in 4* Vana Wiru hotel or similar.